BOOK PARTY! | We love books! We love parties! And we love you. Feeling a little dark lately? Can’t seem to shake that image of a black, billowing cloud just over the horizon? It isn’t just your imagination, dear reader. That cloud is real, and there. But what good are you doing, sitting in your chair and reading the New York Times and getting pissed? Either buy some rubber boots and a plane ticket, irate reader, or do something to take your mind off of it. Come to Book Party, and get a little out of it and into the mind of someone else, for just an evening. Ride your bike on over to the Mandrake and celebrate the small pleasures in life, like riveting stories and delicious drinks. 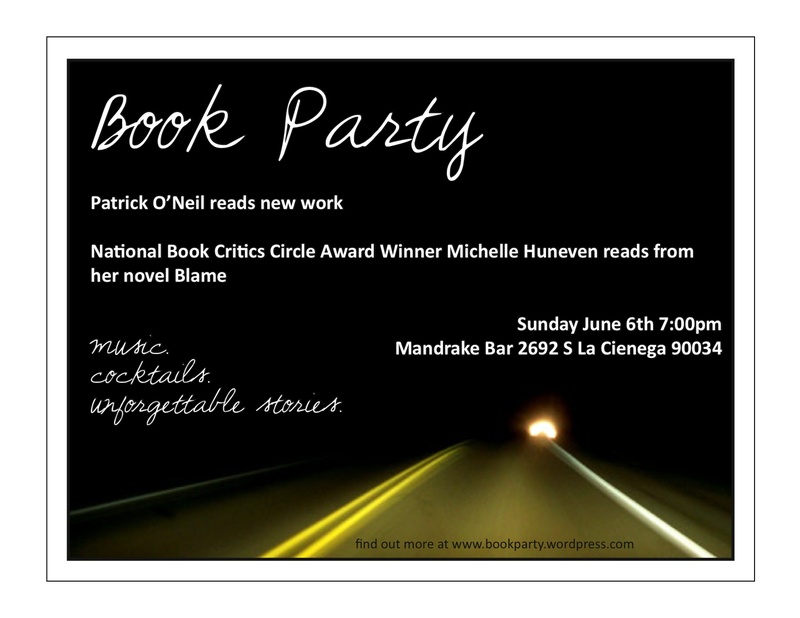 Patrick O’Neil will read from his memoir, Opacity, and Michelle Huneven will read from her newest novel, Blame. You might have heard of it. Dark and Stormies will be on special, DJ Orb will be on hand to spin the literary set list, Blame just came out in a gorgeous paperback and will be available for purchase, and our city’s immense and varied literary talent will be on display. Please come join us. WHY? Because you deserve it, dear reader. Come and let a little light in for an evening, before things get darker. We are so excited about our June writers and our June 6th event. It should be a lovely evening packing plenty of literary punch, so please mark your calendars for these two great writers. More on the eventing to come, but for now, learn a little bit more about Patrick O’Neil and Michelle Huneven. Patrick O’Neil writes nonfiction, makes short films, and when nobody is looking, he plays music. His essays have appeared in numerous literary journals, most notably: Word Riot, Blood Orange Review, Weave Magazine, and SoMa Literary Review. His memoir, about his former life as a junkie bank robber titled Opacity, is busy being read by indie presses and agents. 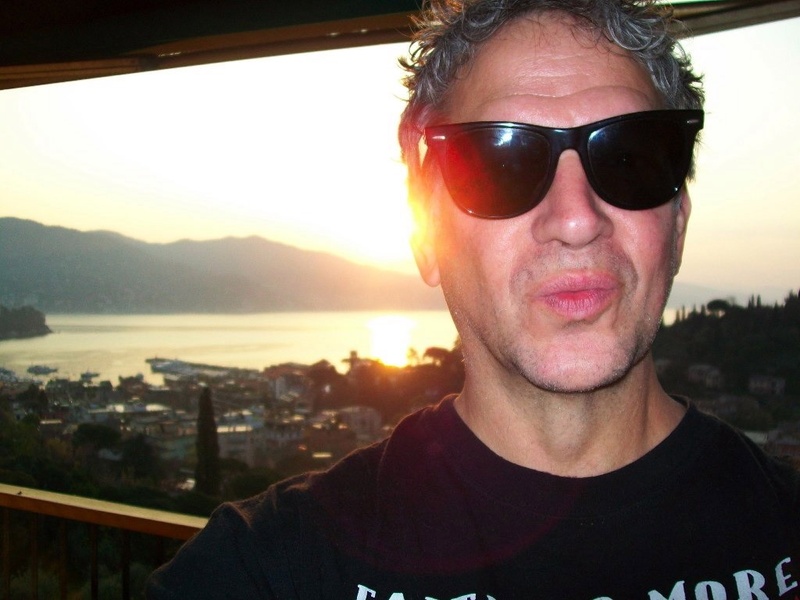 His short punk themed documentaries have been rejected from numerous film festivals. He assistant teaches English comp at a community college to students whose idea of literature is a text message. He currently lives in Hollywood California and holds an MFA from Antioch University Los Angeles. Michelle Huneven received an M.F.A. at the Iowa Writer’s Workshop and her first published story won a G.E. Younger Writers Award and re-publication in Harper’s magazine. Her first novel, Round Rock (Knopf 1997), was a New York Times notable book of the year, one of the LA Times best 100 books of the year. Her second novel, Jamesland (Knopf 2003) was also a New York Times notable book, a Book Sense pick and a winner of the Southern California Booksellers Award for Fiction. Her third novel Blame was nominated for a National Book Critics Circle Award. All three of her novels have been nominated for an LA Times Book Award. Her short fiction has been published in Harpers, Redbook, and the forthcoming Slake Magazine. She received a Whiting Award for Fiction in 2002. Michelle has also co-authored (with Bernadette Murphy) a book on women and real estate, The Tao Gal’s Guide to Real Estate (Bloomsbury 2007). For many years, Michelle worked as a restaurant critic and food writer for the LA Weekly and The LA Times. Her journalism has also been published in the New York Times, O, Gourmet, and many other periodicals. Essays have appeared in the following anthologies: Horse People, Dog is My Co-Pilot, The Knitter’s Gift, Death by Pad Thai, Mr. Wrong. 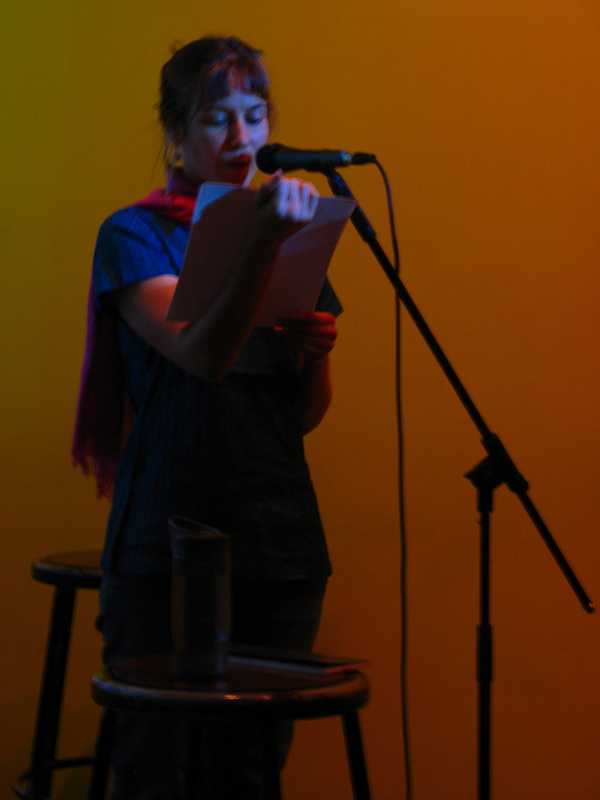 Michelle presently teaches creative writing at UCLA. She lives with her husband and multiple pets in the town she grew up in, Altadena, CA. Thanks to Steve Da Jarnatt & Edan Lepucki for truly incredible readings, and thanks to the huge crowd that showed up to hear them. What a fun evening, with so much literary love in the air! And thanks to Scotch Tape for being a soldier through a mixer issue, and making the music for the night a hit all the same. Photos and more on this March 14th event soon to come, but for now, a big thanks to all involved. 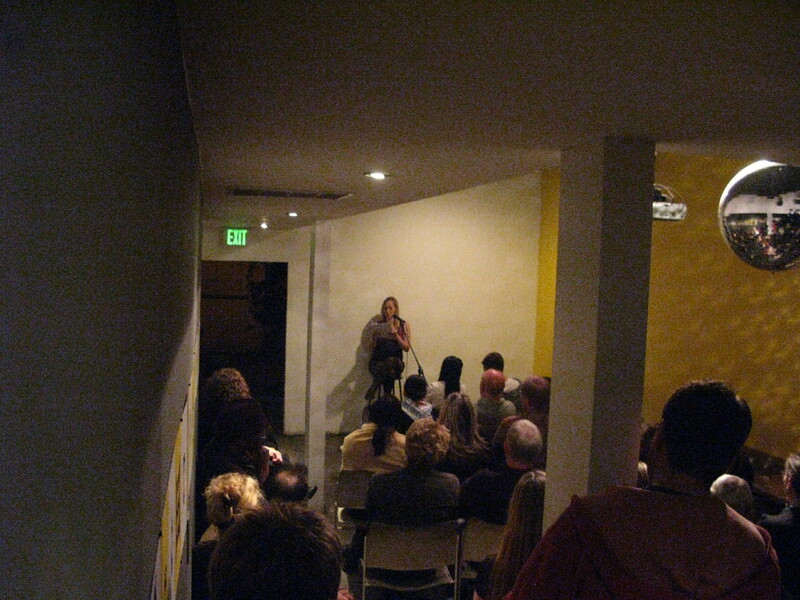 Stay tuned for more on our next event, Sunday, June 6th with Michelle Huneven & Patrick O’Neil. Stop thinking so much. It’s time to let loose at Book Party! We’ve got two red hot, up and coming writers who will leave you wondering why you haven’t heard about them before. Or if you have heard about them, wondering why they don’t have books face out at every store in town. That’s what we want to know here at Book Party. Why aren’t Edan Lepucki and Steve de Jarnatt famous yet? We have no idea. But with de Jaranatt’s recent debut in 2009’s Best American Short Stories and Lepucki’s James D. Phelan award, it doesn’t seem like it will take them very long to get there. 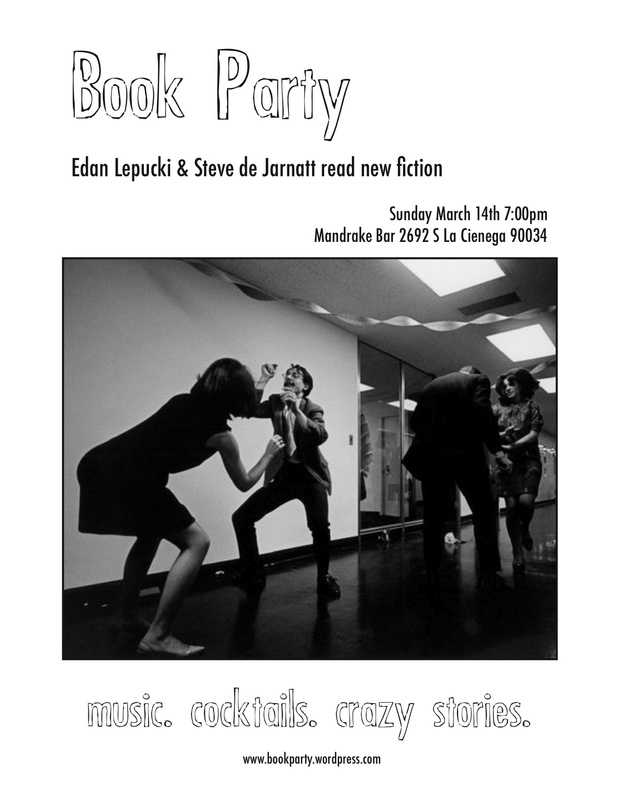 So stop by the Mandrake Sunday, March 14th at 7:00 pm. Cocktails begin then, and readings start around 7:30. Come and support strong emerging literary talent in Los Angeles, dear readers. Forget about your responsibilities for the night, and come get lost in the work. What: Compelling stories. Delicious cocktails. Sweets. Fresh beats to go along with the work. And people who like to read, milling about, batting their eyes at you in mysterious ways. Why: Because we love you. That’s why. Don’t let these writers be discovered later. Discover them now. 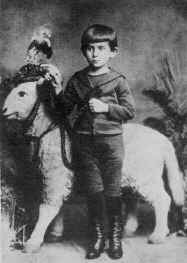 Kafka would appreciate it. Edan Lepucki was born and raised in Los Angeles. A graduate of the University of Iowa Writers’ Workshop, she has published fiction in the Los Angeles Times Magazine, Meridian, Narrative Magazine, and FiveChapters, among others, and she’s a regular contributor to The Millions, a books and culture website. 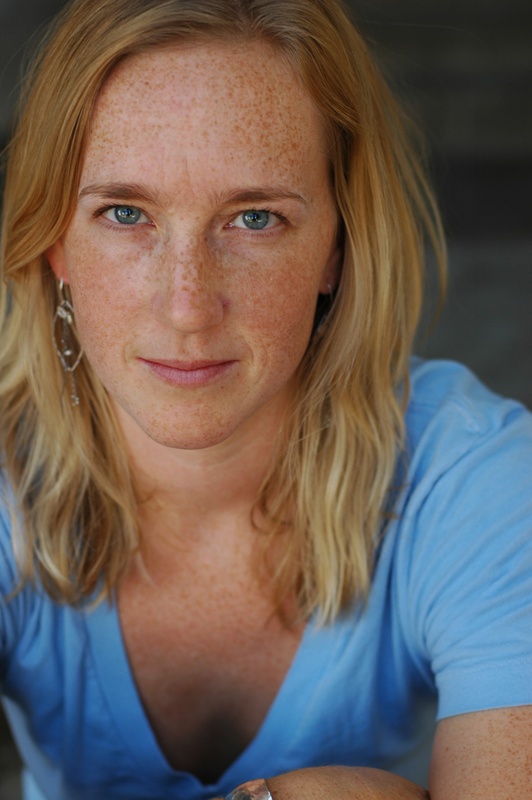 She won the 2009 James D. Phelan Award for her recently-completed novel manuscript, Days of Insignificance and Evil, and she has received fellowships from the Vermont Studio Center and the Ucross Foundation. She is the founder of Writing Workshops Los Angeles, private writing school for the brave, enthusiastic and talented. 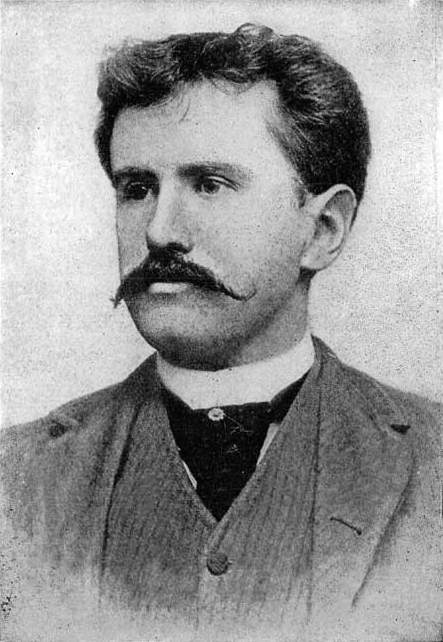 Steve De Jarnatt grew up in the small logging town of Longview, Washington. He has new work in the fall issue of Santa Monica Review and Citron Review. His story, Rubiaux Rising, was selected for The Best American Short Stories 2009, guest edited by Alice Sebold. 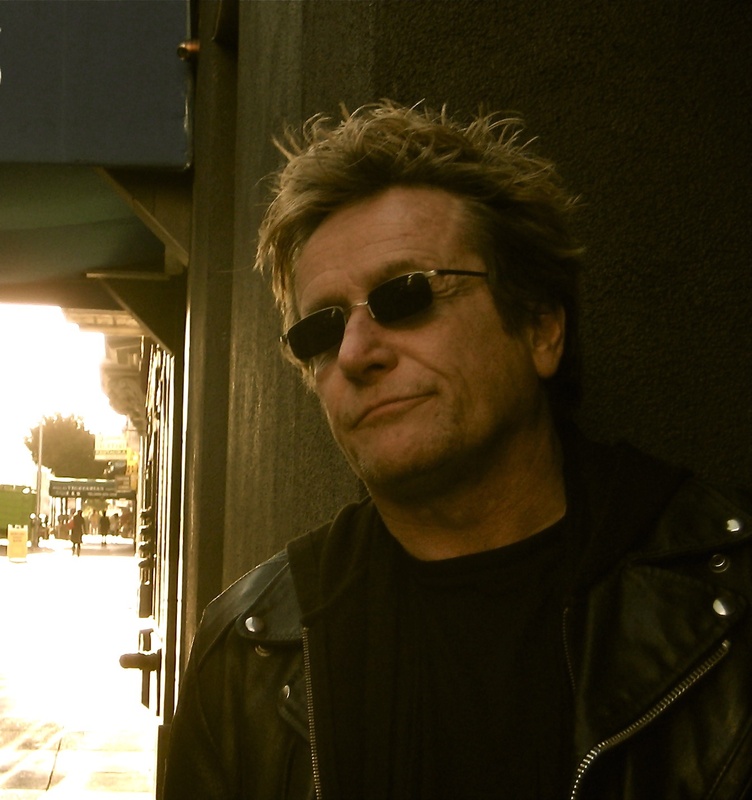 He is new to fiction, having just completed the Creative Writing MFA program at Antioch University Los Angeles after a long career as a writer and director in film and television. The indie cult film, Miracle Mile, among many credits. He currently dwells in Los Angeles. Enormous thanks to Jennine Capó Crucet & Amina Cain for giving incredible readings, and gratitude to all who came out to hear them. We had a lovely literary evening. 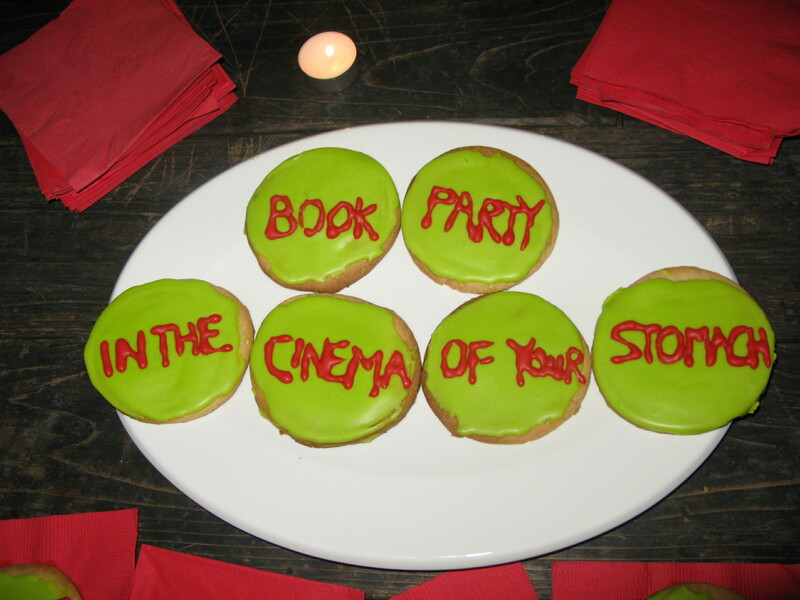 Our next Book Party event will be in March, more to come on that very soon. But until then, thanks to Amina and Jennine, Les Figues, DJ Orb, the Mandrake, and you, dear readers, for making the December reading a night to remember. Happy 2010 to you all! This Season’s Perfect Gift? Book Party, Of Course! So you’re broke again this holiday season? Wait, don’t cut off all your hair to buy your man a chain for his watch. . . why cut off your lovely locks when you could just bring him to the December 13th Book Party? 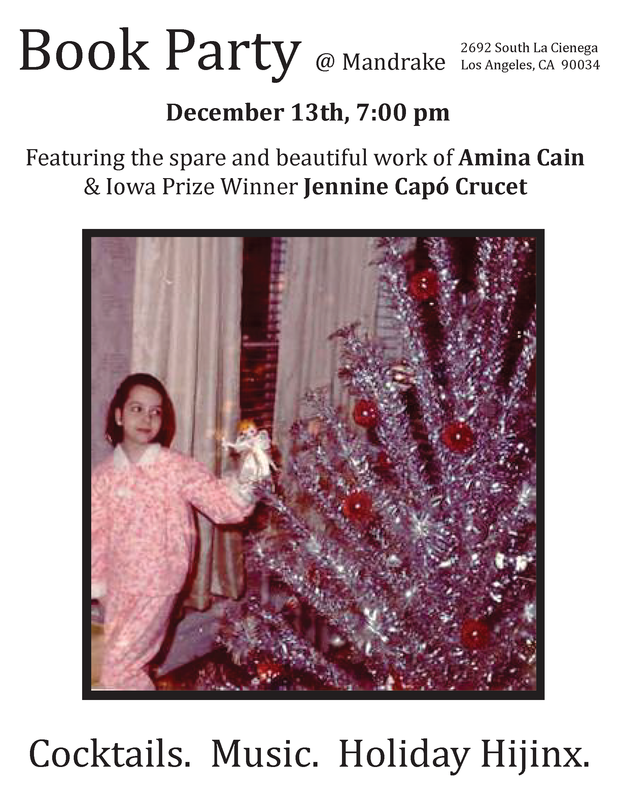 With Amina Cain and Jennine Capó Crucet, it’s sure to be a gift that even O Henry would approve of! So don’t stay home and stare at your sorry tree. Light your menorah, and come on down to the Mandrake at 7 for good literature, stiff drinks on recession special, hot jams, overly frosted cookies just like your mom made, and some serious holiday cheer. Oh and did I mention books? Oh yes. You better believe we’ll have those too. Hang out and shop all at once. Tis’ the season to multitask! 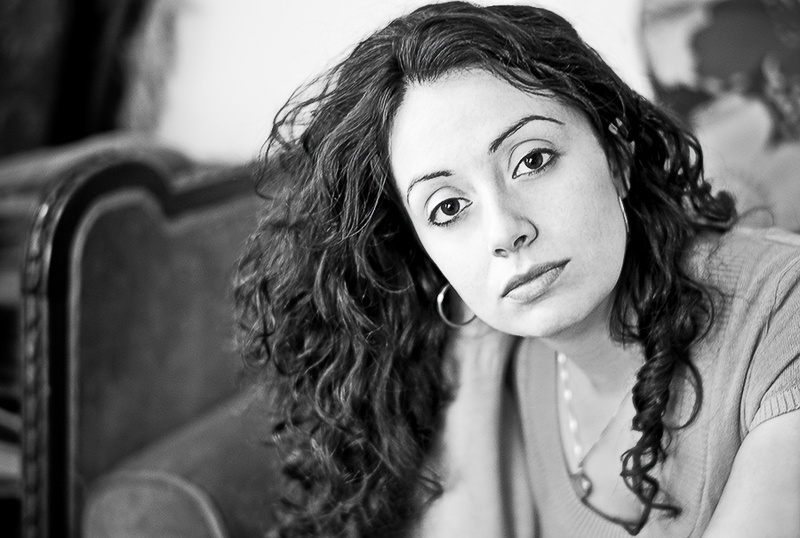 Jennine Capó Crucet is the author of the story collection How to Leave Hialeah, which won the Iowa Short Fiction Award and was a finalist for the UC Irvine Chicano/Latino Literary Prize. 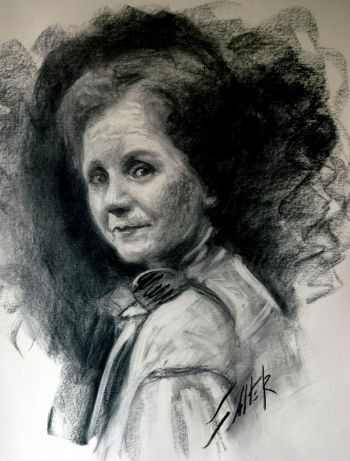 Her stories have appeared in Epoch, the Southern Review, Ploughshares, Crazyhorse, Gulf Coast, the Northwest Review, and elsewhere. 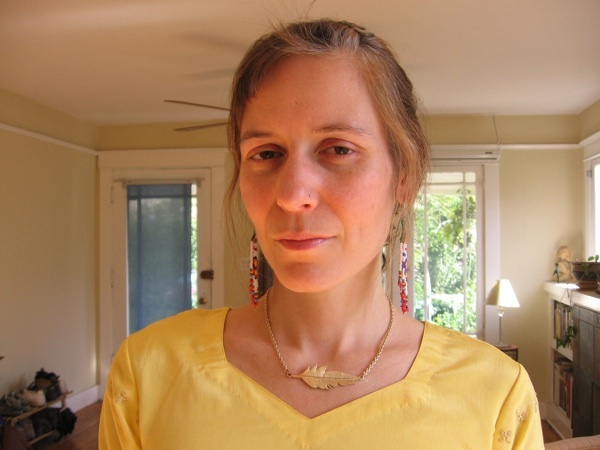 She is the recipient of this year’s John Winthrop Prize for Emerging Writers, as well as scholarships to the Bread Loaf Writers’ Conference. Her stories have twice been nominated for the Best New American Voices anthology and she’s been a finalist for the Missouri Review Editor’s Prize for short fiction. Raised in Miami and born to Cuban exile parents, she moved to Los Angeles this past January where she works as a college advisor for the One Voice Scholars Program. She’s also at work on a novel and a new collection of stories. 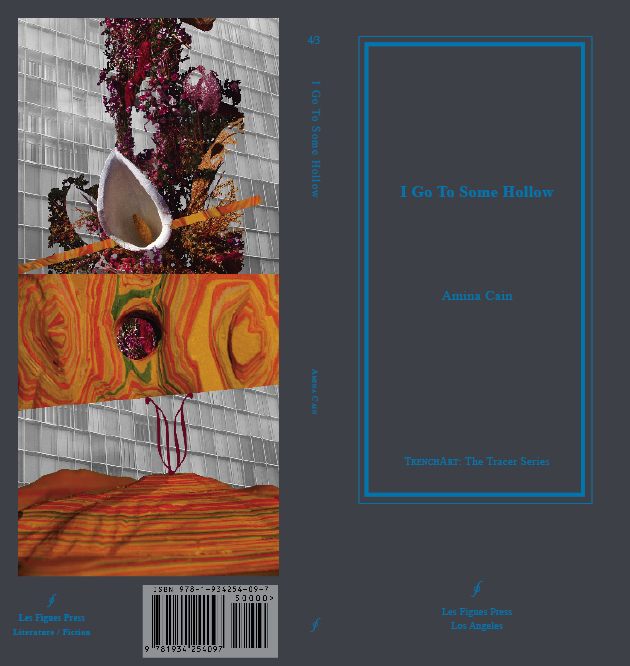 Amina Cain is the author of I Go To Some Hollow (Les Figues Press, 2009), a collection of stories that revolve quietly around human relationality, landscape, and emptiness. She is also a curator (most recently for When Does It or You Begin? Memory as Innovation , a month long festival of writing, performance, and video) and a teacher of writing/literature. Her work has appeared in publications such as 3rd Bed, Action Yes, Denver Quarterly, La Petite Zine, and Sidebrow, is forthcoming in The Encyclopedia Project and onedit, and was recently translated into Polish on MINIMALBOOKS. She lives in Los Angeles. So join us for two incredible readings. Come. After all, we’re being incredibly generous. Book Party is thrilled to have two amazing Los Angeles writers reading on Sunday, December 13th. Amina Cain, author of I Go to Some Hollow, and Iowa Prize Winner Jennine Capó Crucet, author of How to Leave Hialeah. We’ll have much more on this exciting evening soon, but for now, mark your calendars for the 13th for cocktails, cookies, and serious literary stimulation. 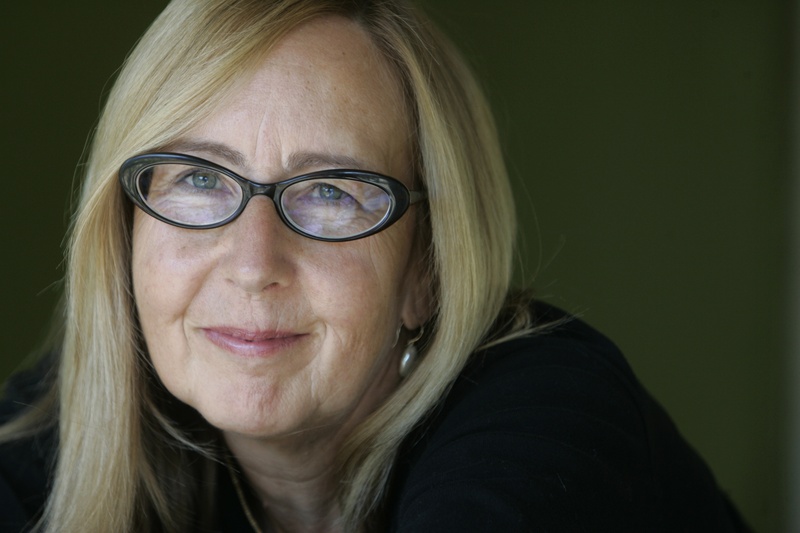 In the meantime, Book Party would like to mention how much it misses LA literary hero, Liz Anderson! 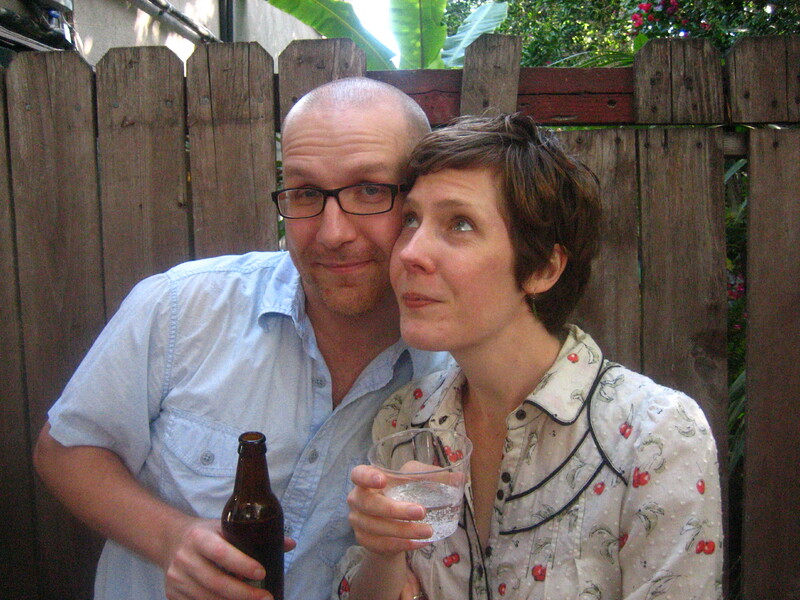 She moved away to Minneapolis with her husband Scott to pursue all sorts of interesting things, but we miss her like crazy at Book Party. We know you had to go, but things just aren’t the same without you! 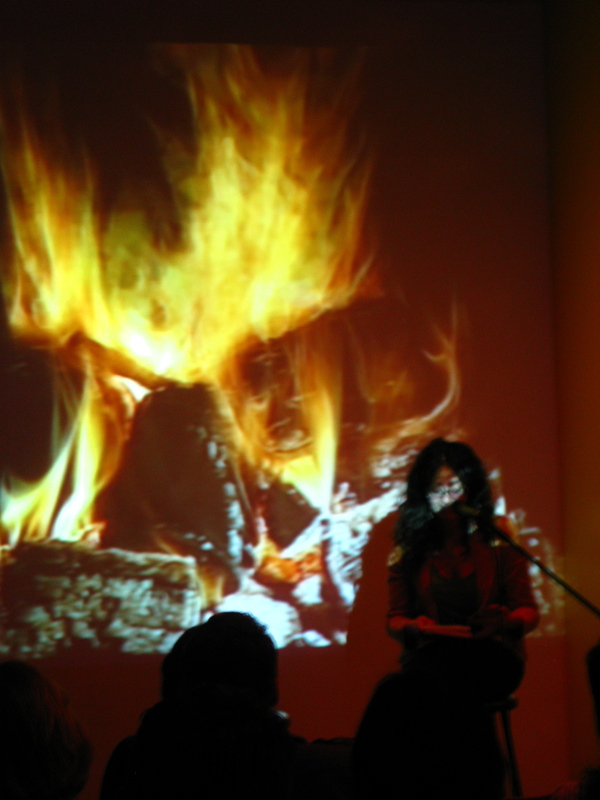 Thanks for a Burning Hot September Book Party! A very belated thank you to all who came out to make September’s Book Party such a delightful evening! First and foremost, thanks to Richard Lange and Dennis Fulgoni for both being so charming and treating the crowd to truly top notch work. And a huge thanks to Susan and Scott for all the help and the incredible photos, and to Small World Books as well, for coming and bringing those beautiful copies of This Wicked World. Our next Book Party event will be on December 13th, so check back here for details, but we promise, it will beat the pants off of any holiday celebration around. Literature, drinks, and no terrible arguments with your uncle about heath care reform! So mark your calendars for December 13th, and we’ll be in touch with the line up very soon, dear reader.